You get invited to read to a bunch of students at a private school in Oakton to celebrate Dr. Seuss's birthday and Read Across America day. It is also school spirit week at this institution and the day I'm visiting is dress-in-all-the-same-color day. As the cheery-and-not-at-all-moody-person-I-am, I'm going with head-to-toe black, which will be worn with the red and white striped hat the School Director is providing for me. To recap: Tomorrow, I'll be reading childrens books and enjoying Turkish delight while dressed as the cat in the hat. 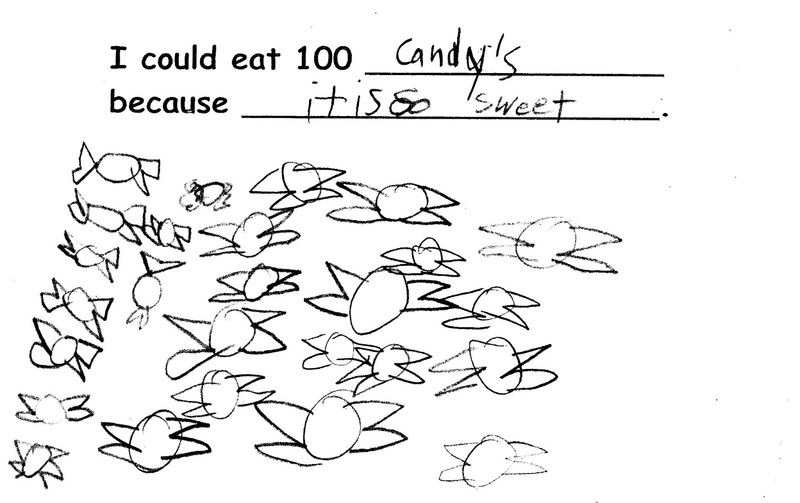 Recently, my daughter's first grade class celebrated their 100th day of school. Part of this celebration was completing a booklet with information having to do with hundreds of things. 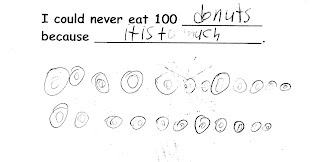 For example: What could she eat 100 of? 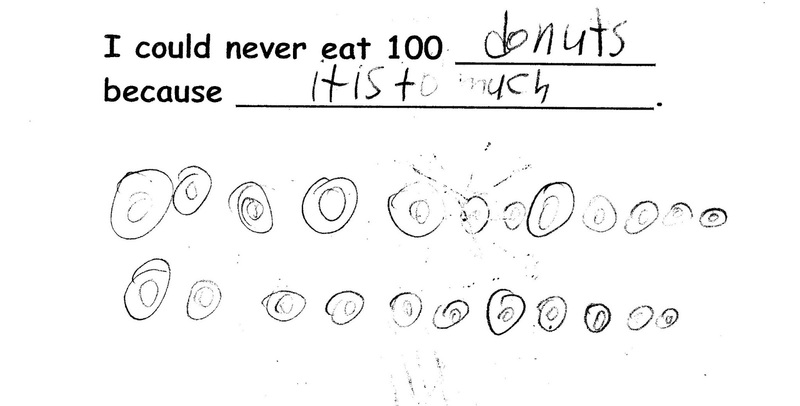 Next question: What could she not eat 100 of? 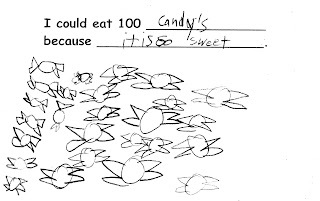 If she could have 100 of anything in the world, what would it be and why? This says, "dreme hauses with a hot tub and hamick. It will be asum." Hey -- go big or go home(s), right? Asum! 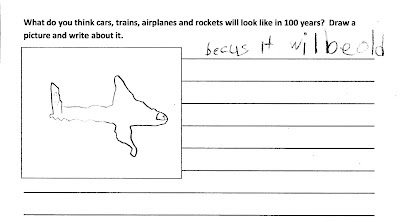 And finally, she was asked what she thought cars, trains, airplanes and rockets would look like in 100 years. Yes. 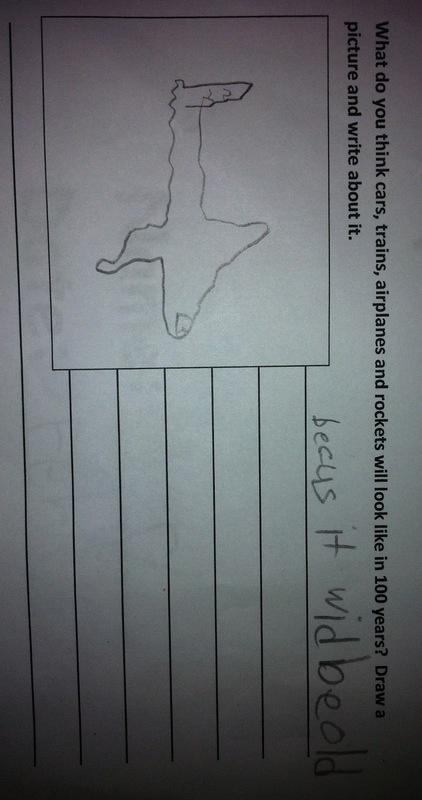 "becus it wil be old." I'm a girl who knows how to have a good time. Which my husband was reminded of again last weekend as I tried to pass off "an evening lecture at the George Mason University observatory" as a birthday gift. Actually, this event followed the GMU homecoming basketball game on Saturday night, the tickets to which were yet another birthday gift. (Or would have qualified as one had the Patriots not lost by 20 points.) The spectacular loss was followed by a spectacular fireworks show over the lake on campus -- so the evening turned around a bit at that point. And continued to get even better as we made our way across campus to the observatory and joined about 12 other cools who considered this a hip and happenin' way to spend a Saturday night. The lecture was really interesting -- and we got to see the new half million dollar (said with pinkie touching corner of mouth) telescope and the dome in which it is ensconced -- all very sci-fi and cool. We learned something, we asked questions, it was all great fun. Until...the professor pronounced "Uranus" in a way I'd never heard before -- as "YUR-a-nuss." We immediately assumed this was a defense mechanism borne from teaching college students who probably snickered every time he said the name of that particular planet. And I'll be honest...that is why I'm so glad not to be in college anymore, with people mocking and giggling at things that sound dirty and being sidetracked from real learning by focusing on the nonsense. 1. Do you really think it's appropriate to show us so many pictures of Uranus? 2. Has Uranus been erupting? 3. Are there alien life forms on Uranus? 4. How big is Uranus? 5. Do you find that gay men, in particular, tend to focus their area of study on Uranus? 6. Can I point this telescope at Uranus? 7. What is the temperature of Uranus? 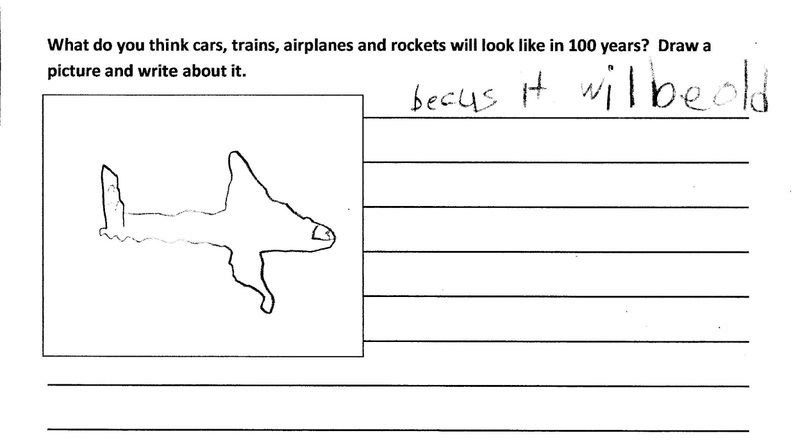 Each question was followed by hysterical laughter. From my husband and me, that is. My 7-year-old daughter (who didn't quite get the joke) gave us an eye roll after each question and admonished us with a "That's enough." Subject: It's my lucky day! Congrats on your free F%*kBook account! Subject: Re: It's my lucky day! Is the CEO of that corporation Mark F%*kerburg? Guess "getting poked" means something a little different on that site? Instead of a "Friend" request, do you get a "Friend with Benefits" request? Do the posts about people playing games involving farm animals take on a whole new dimension? Instead of "Likes" does the page show "Licks"? American Airlines just called to verify that an airline ticket from Mexico City to Bolivia that someone was trying to purchase with my credit card was authorized. And with that, ladies and gentlemen, I am on my second replacement card in less than a year. You'd think that would be the worst part. However, it is not. The worst part is that whoever stole my card thinks I'm small potatoes, as is evidenced by the fact that the only other purchase made with the stolen card was at a One Stop in Bismarck, Arkansas, for a grand total of $3.63. I guess my thief assumed I wouldn't notice an extraneous beef jerky purchase. (And, to be fair, I almost didn't.) And I could live with that had I not heard a tale from one of my friends who had his identity stolen. Apparently, his thief bought a Porsche Boxter -- something he discovered when he received the loan documents in the mail. So now I just have a lot of misplaced anger for my thief. What -- I'm so un-fabulous that you don't even try to buy season tickets for the Lakers? Some haute couture? A share of a private jet? What about dinner at a nice restaurant? A few good bottles of wine? A botox touch-up? Nope. Just $3.63 worth of convenience store crap in Arkansas, no less. Is that all I'm good for? A roadside Red Bull? While at a comedy club recently, a member of our group walked by a table where he overheard one person at the table say to another person at the table (and I quote): "Homey don't play that" which was followed (naturally) by an awkward high five. Of course, the perpetrator was white, middle aged, and said this without a hint of irony. Anyone under the age of 35 probably has no frame of reference for this. Which makes it the perfect phrase replacement for "You kids get off my lawn" (said while shaking a fist at trespassing whippersnappers). You know that if anyone was going to heckle the comedians that night, it was Mister "Homey don't play that." How judgmental we'd feel if it turned out the gentleman we overheard did, in fact, know someone named "Homey" and he was, in fact, referring to something that Homey did not play.